In April 2012 we purchased 3 Blue-Green Chromis. It seems that Chromis are always at odds with each other, always picking and chasing each other. Six months after we purchased them, one of them simply stopped showing up at feeding time and we never did find out what became of him, but I wouldn’t be surprised if he was just picked off or injured by the other two. Now, our largest of the two Chromis has picked on the smaller one to the point that he has an injured mouth. It gets stuck out at times and he has a difficult time eating. We have resorted to feeding him with a turkey baster in his secluded spot away from the other fish where he rarely comes out of hiding. Despite his injury, most days he does very well eating, and we have found that dropping pellets from the baster directly on top of his head works best. He reminds me of a seal in a circus because on the days his mouth is stuck open, he will bounce the pellets off the top of his head, and them position himself under them allowing the food to fall into his open mouth. 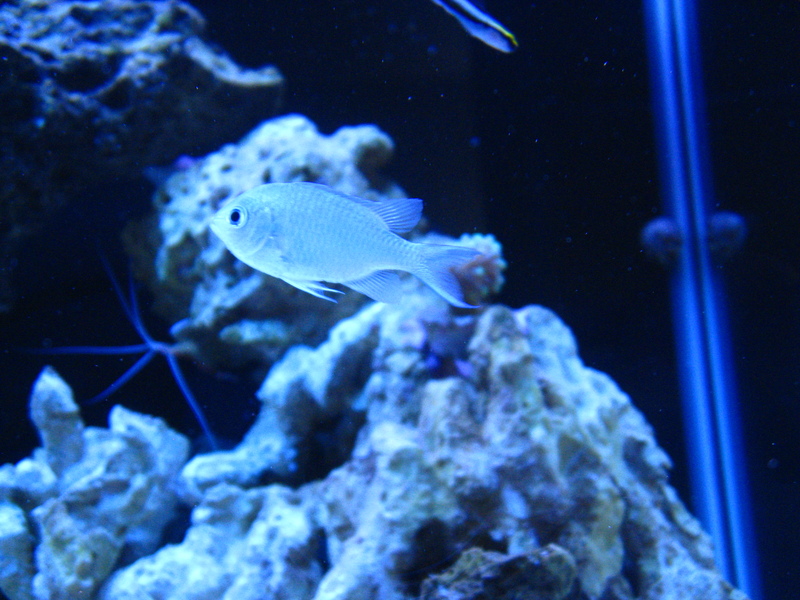 However, some days he is so distracted by keeping an eye on the larger Chromis, he barely eats. Despite our efforts to feed him each day at least 10 to 15 pellets of food, he is very skinny. We don’t usually get a chance to feed him more than that before the larger Chromis figures out what we are doing and bully’s the smaller one back into hiding. We have tried in vain to catch the larger Chromis, even rigging a line and hook, but he is very clever. We tried catching him with a net repeatedly, but have resorted to simply chasing him off as best we can while feeding the injured Chromis. I feel it is only a matter of time until he dies, but meanwhile, a turkey baster and a little patience is all we have. This entry was posted in Uncategorized and tagged aquarium, Chromis, feeding, injured, mouth, reef. Bookmark the permalink.